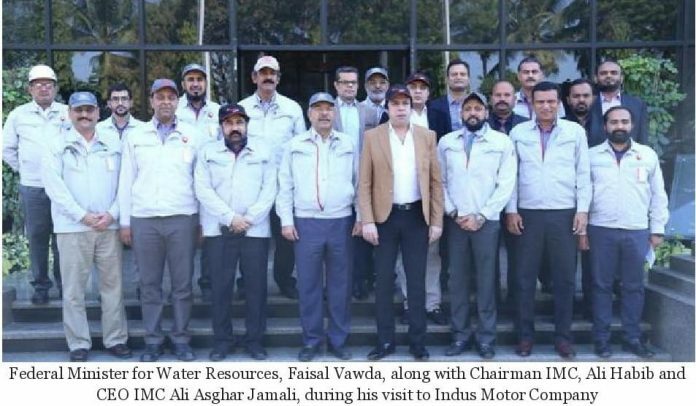 Karachi, February 04: Federal Minister for Water Resources, Faisal Vawda appreciated Indus Motors Company’s sustainability initiatives including contributions for Dam Fund, upon his visit to IMC to participate in IMC’s Million Tree Drive. He was briefed on IMC’s commitment towards make in Pakistan by developing a strong local engineering and vendor base. He was also briefed on IMC’s contribution in the National Exchequer, employment generation and transfer of technology. Challenges being faced by the sector were also highlighted and discussed. The minister took keen interest in the company’s operations and commended the company’s efforts to promote localization, utilizing domestic workforce and striving for sustainable growth. He further asserted to support Pakistan’s auto industry in future. Mr. Ali S. Habib, Chairman Indus Motor Co. said, “In our flagship brand, Toyota Corolla, whenever you touch a part, there is 90% chance that part is localized and produced locally”. While briefing the minister on IMC and its various initiatives, CEO Ali Asghar Jamali said, “Through localization the domestic auto industry purchases more than 150 million rupees worth of parts daily from local vendors, thereby, saving foreign exchange and creating countless job opportunities for the people of Pakistan”. Lauding the government’s efforts to boost auto sector, he requested that the policy should encourage local manufacturing of parts because that is what will generate employment and create a sustainable value chain in the sector, Jamali added.